The Indianapolis Colts have suffered a slew of injuries during training camp, and the most recent one may be one of the most damaging. Colts head coach Chuck Pagano announced Thursday that center Ryan Kelly will undergo surgery to treat a “bone defect” in his foot. The initial timeline on Kelly’s injury is six to eight weeks. That will keep him out for at least the first month of the regular season. Kelly originally injured the foot during a joint practice with the Lions last week. He’s been in a walking boot ever since. The Colts were hoping that the injury would heal on its own, allowing Kelly to get back by Week 1. However, little progress has been made, forcing Kelly to go the surgical route and miss an extended period of time. 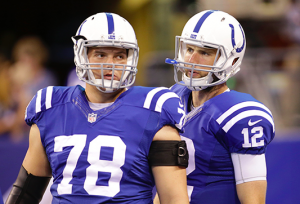 The Colts have struggled in recent years to put together a competent offensive line in front of Andrew Luck. Kelly appeared to be a key part of turning things around. He started every game as a rookie last season after Indianapolis drafted him in the first round out of Alabama. The Colts were counting on him to anchor the offensive line again this season and for many years to come. There’s now a huge question as to who will replace Kelly at center until he’s ready to return. Veteran Brian Schwenke may have been first in line for the job. However, he’s on the PUP list because of a foot injury. Undrafted rookie Deyshawn Bond is currently at the top of the depth chart. He started last week’s preseason game against the Colts and should be in line to start again this week against the Cowboys. Jack Mewhort and Denzelle Good may also see snaps at center while Kelly is out. At this time, Pagano is not ruling out looking outside the organization for help replacing Kelly at center or improving the offensive line elsewhere. Free agent Jeremy Zuttah was in camp with the Colts last week. To make matters worse, there still isn’t clarity on who the Indianapolis offensive line will be protecting when Week 1 rolls around. Luck is still not throwing the ball at full strength following surgery to repair a tear in his labrum. The Colts have given no guarantee that he will be ready to play Week 1. If Luck isn’t ready, veteran Scott Tolzien will likely start the team’s opener. However, offensive coordinator Rob Chudzinski said the playbook would need to be altered if Tolzien is starting and not Luck. With Kelly’s name added to the list of injured players, Pagano and the Colts have to feel deflated. Even with more than three weeks until Week 1, the Colts have a rather lengthy injured list, with little assurance that several key players will return before the start of the season. Luck is obviously the most important player who’s questionable for the start of the season. But losing Kelly until at least October is also a huge blow for the Colts in 2017.